(CNN) -- Russia defended its recognition of two independence-seeking Georgian provinces as a U.S. ship carrying aid docked in Georgia on Wednesday. The U.S. Coast Guard cutter Dallas arrives in the Georgian port of Batumi. 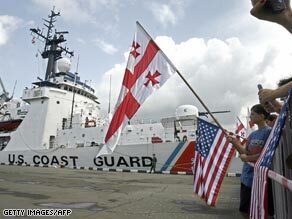 The U.S. Coast Guard cutter Dallas bypassed its original destination, the Georgian port of Poti, which is controlled by Russian troops still in the country despite a cease-fire deal to end conflict between the two countries. The Dallas carried 80 pallets with more than 76,000 pounds of relief supplies, the U.S. Sixth Fleet public affairs office said in a statement, including hygiene items, food, milk and juices. The cutter is delivering aid as part of a larger U.S. program that has delivered supplies worth at least $20 million to Georgia. More than 50 U.S. military flights have also landed in Georgia. And a U.S. Navy ship -- the USS McFaul -- recently arrived at the Batumi port with 155,000 pounds of bottled water, milk, baby food and other items, the U.S. Navy said. The United States says it has also delivered sanitation facilities, tents, bedding and dry and canned goods to Georgia. Russia's recognition of South Ossetia and Abkhazia Tuesday raised the stakes in a stand-off between the West and Moscow over the future of the provinces and of Georgia. Russian military entered Georgia proper from the provinces in early August after Georgian troops attacked separatists in South Ossetia. Russia called it an extension of their peacekeeping duties. The West and Georgia called it an invasion. Russian President Dmitry Medvedev said recognizing South Ossetia and Abkhazia "was not a step taken lightly, or without full consideration of the consequences." Russia and the Caucasus region are jumbles of nationalities and, Medvedev said "relations between nations living 'under one roof' need to be handled with the utmost sensitivity." He said after communism fell, Russia "reconciled itself to the 'loss' of 14 former Soviet republics, which became states in their own right" and observed that around 25 million ethnic Russians "were left stranded in countries no longer their own." One of those former Soviet republics is Georgia, which "immediately stripped its 'autonomous regions' of Abkhazia and South Ossetia of their autonomy," he said. He said Russia had enforced peace but "fears and aspirations of the South Ossetian and Abkhazian peoples" lingered because Georgian President Mikheil Saakashvili talked of rearming his troops and "reclaiming 'Georgian territory.'" Medvedev said the West ignored "the delicacy of the situation." Germany on Wednesday added its criticism to Russian recognition of the two republics. Chancellor Angela Merkel told Medvedev by telephone the move violated international law and the six-point Russian-Georgia cease-fire agreement brokered on behalf of the European Union by France. Merkel said: "The continued Russian presence in Georgia outside of Abkhazia and South Ossetia, for example, in Poti, represents ... a significant violation of the six-point plan agreement." French Foreign Minister Bernard Kouchner said: "We cannot accept these violations of international law, of accords for security and cooperation in Europe, of United Nations resolutions, and the taking ... of a territory by the army of a neighboring country," the Associated Press reported. The Bush administration has insisted that both Abkhazia and South Ossetia remain part of Georgia, a U.S. ally that is seeking NATO membership. 2 Commentary: Is McCain out of his mind?